Founded in 2004 by wine lover Christopher Spann, The Wine Market is a unique bistro, wine bar, and wine shop all under one roof. The Wine Market has been recognized in national magazines such as Elle Decor and Wine and Spirits and locally in many publications like Style Magazine, Baltimore Magazine and The Baltimore Sun. We proudly offer over 25 wines by the glass and an 800 bottle selection in the wine shop. For a small corkage fee any of the wines from the shop can be enjoyed at your table in the bistro. We feature a beautiful courtyard patio in the warmer months and a sophisticated Soho Loft like dining area inside all year. Brunch & Lunch Menu Options: Prices are for food only. We use the freshest ingredients available. Menu items subject to change due to availability. Menu A, $26 per person Menu B, $25 per person • Family Style Shared Appetizers - Seasonal Flat bread Pizza and Olive & Potato Plate • Second Course - please select 3 (parties of 30+, select 2) • Dessert Course - Seasonal Sorbet Scoop Menu C, $28 per person Menu D, $35 per person Please refer our attached brunch & lunch menu for complete details. Dinner Menu Options: parties up to 22 guests - please pick 3 appetizers, 3 entrees and 3 desserts parties from 23-30 guests - please pick 3 appetizers, 3 entrees and 2 desserts parties from 31+ guests - please pick 2 appetizers, 3 entrees and 2 desserts Menu: First Course - appetizers Second Course - entrees Dessert Please refer our attached dinner menu for complete details. 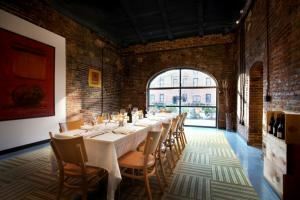 Our best friends held their rehearsal dinner in the private dining room last year and it was AWESOME! From the staff to the space and of course, the food! We would definitely recommend to others and hope to use the space for our own rehearsal dinner down the road. Special Features: Inventive, seasonal menu that can be oriented to any specifications by CIA-trained Executive Chef Jason Lear with over 1000 choices of wine for any taste.